aka earphones, especially the in-ear type. Headsets, in contrast, include a microphone. 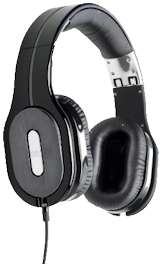 For the same dollars, you can get much higher sound quality with headphones or earphones than with speakers. 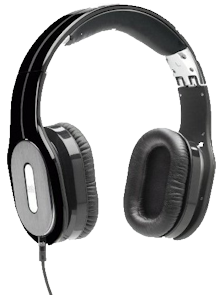 With earphones you can block out the noise surrounding you and the sound you are listening to will not bother others. Some have sound-cancelling logic to filter out background sound. Some earphones/headphones let you hear background sound. Some seal it out. You might use earphones on your computer sound output or on your Mp3 player. The current state of the art is the Sonomax Soundcage. It can be programmed to let through only certain outside frequencies or volumes. You can’t judge sound quality. You can’t judge durability. What might look durable through the packaging make turn out to be silver painted cheap plastic. One way around this is to buy only products you have tried out belonging to a friend. You can also check out reviews from as many different sources as possible. Headphones for phones, laptops and PCs are under 50 &ohm;. 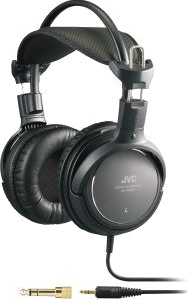 High end headphones for stereo systems may be 250 or even 600 &ohm; which require a headphone amplifier. Your PC does not care the impedance for a USB (Universal Serial Bus) headphone/headset. If you are watching an online streaming movie and the sound keeps breaking up or generally bad quality, even though it is digital, the problem is the packets are not coming fast enough and the software is filling in a little bark wherever the data for the sound are missing or late. You can try reducing the size of the picture, to reduce the total number of packets per second that have to squeeze through your Internet connection. You can also see if there a way to download the video, or fetch it from DVD (Digital Video Disc) and watch it later offline. Find a program or test that will make some sound in the left ear, then the right, then both. This quickly lets you ensure your headset/headphone hardware is working. Make a note of where you found the software. There are converter plugs you can buy separately that let you use a traditional headphone jack in a USB port. For digital-noise-free quality, you use USB connectors. They can produce 6.1 or 7.1 or in theory any number of channels. 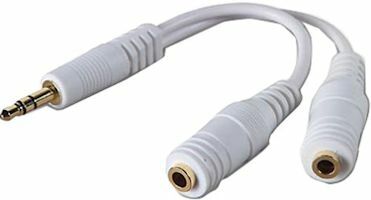 The sound ports that come with the motherboard typically offer a connector for a 3.5 mm stereo jack. Apple products such as iPod, iPad, iPhone all use the 3.5 mm stereo jack too. Eventually, Apple may offer proprietary digital sound headphones using its lightning connector. Wireless headset with durable comfy over-the-head noise-cancelling earphones and integrated directional microphone. Ability to temporarily turn off the noise cancelling feature when you need to monitor room noise. Connects simultaneously to your USB computer port, Stereo S/PDIF (Sony/Philips Digital Interconnect Format) port and telephone jack. It merges the sound from all three. A computer application lets control the mixing and auto-muting, e.g. default stereo shuts off when computer makes a noise and computer sound shuts off when a phone call is in progress. It is a software phone, with a conventional POTS (Plain Old Telephone Service) connection, not VOIP (Voice Over Internet Protocol). You do your dialing with a computer app. You can answer the phone or hang up with a button on the headset and wander around talking. You can take computer dictation wandering around your home. It might work with Blue Tooth, WiFi (Wireless Fidelity) or its own private RF (Republican Fantasy) band. The range should be a the size of a typical house. It would let you take phone calls anywhere in your home. It would have the precautions to prevent others from snooping on the traffic. It has a recharging cradle. The cradle has cables to your computer, stereo, phone jack and AC (Alternating Current) wall outlet. Plantronics makes some devices that make a crude stab at such a device, that integrate computer and phone, but not stereo. They use custom interfaces to a a physical telephone using mechanical lifters to answer the phone. That is too Rube Goldberg to even consider. An interface to the phone jack would be much simpler, reliable and would give much higher sound quality. The headset holds the microphone in place right in front of your mouth no matter where you turn your head. The headset holds the microphone close to your mouth, which lets the noise canceling logic easily tell your voice apart from background noise. USB port will attach to a laptop that does not have the necessary analog jacks. USB port is immune to electrical hum emanating from the computer. If the microphone breaks off from the headset, you must buy a whole new unit. For the same dollars, you can get better quality equipment. If you make a video, you don’t have to look like a geek wearing a headset. You can spend your dollars where you need the extra quality, on the microphone or the headphones. You must hold your head steady, pointed at and close to the microphone. You can’t turn your head to look at parts of the screen. You need some way to mount the microphone close to your mouth. Let’s you attach two headphones, but not two headsets, simultaneously. 3.5mm. Belkin is a quality brand. When buying a splitter, make sure you get one for desktops/laptops. Make sure it lets you attach to headphones, not one headset to split out the microphone jack. non-USB headphone. No microphone. Full size. Big pillowy padding. Specs. 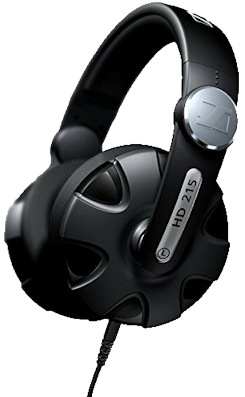 There is some confusion if this is called a HD215 or and HD215II. The HD215 may be an older version. Closed. 12 — 22000 Hz. Reviews suggest this is comfortable and durable. I concur, it is comfortable, however, the band that goes over your head is made of plastic. That suggests it will break easily. However, the foam will start to flake off after the first year. You can buy replacement ear pads. It is not USB. It comes with two sizes of jack (one screwed inside the other) so you can use it on your computer or your stereo. DJ class. It strongly cuts out room noise. You insert it in the lime green socket on your PC, and, in the control panel, configure your PC to use speakers, not headphones. It does not have a volume control on the cord. You use your stereo or PC volume controls. It has a long stretchy coiled cord. It does not get fouled around furniture the way an uncoiled cord does. This is what I have myself. I am quite pleased with it. About the only negative is it feels clammy after extended use. 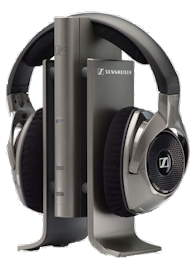 It was my second choice after the Beyerdynamic MMX 2 which has been discontinued. specs. non-USB headphone. No microphone. Lime with black accents. Three different gold-plated tips. Made in Austria. 10Hz to 39.8kHz. Non-USB. Noise cancelling. Designed primarily to hook up to a stereo. Has a connector for use in airplanes. Use battery that lasts 35 hours. They use conventional cables. Goes around the ear. The Model 3 is on-ear. 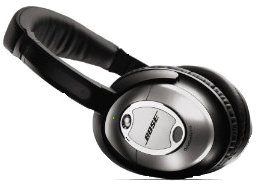 Bose does not divulge the specifications. They expect you to trust they will be good just because of the brand name. details. 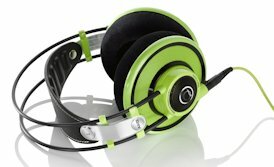 Wirecutter.com say they do the best noise cancelling. electronic link to Sony h.ear on Premium Hi-Res Stereo Headphones, Lime Yellow. 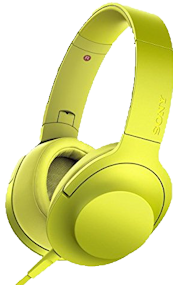 recommend electronic⇒Sony h.ear on Premium Hi-Res Stereo Headphones, Lime Yellow. Also come in Viridian Blue, Charcoal Black, Bordeaux Pink and Cinnabar Red. Solid vibrant colours, not just accents. Not USB. Connector: L-shaped gold-plated 4-pole mini plug. I don’t know anything that uses this format of plug directly. You would think you would need some sort of adapter to convert it into 3-pole plug that the PC uses, but some say it will work directly. 5—60,000 Hz. specs. Online electronic stores carrying Sony h.ear on Premium Hi-Res Stereo Headphones, Lime Yellow. No noise suppression. Top rated by Wirecutter.com. Comes in white, red, grey and black. No USB connection. Specs. Includes charging station. Non-USB. specs. With noise suppression. No USB connection. Top rated by Wirecutter.com. Comes in white, red, grey and black. Specs. 600 &ohm; Make sure your stereo is capable of driving it. Over the ear. Noise isolation.